I love it when the house is quiet and I’m left alone to concentrate on my culinary creations. I say alone, even when my husband’s at work and the children are at school, I am never truly alone. Since we are a family of dog lovers, I have had a string of loving companions by my side every moment of every day for my entire adult life. Over the years we have had some great dogs and some that were no more than terrorists in fur coats. One of the bigger characters we adopted was a dog we named Roxanne. Roxanne was the first (and last) big dog that we ever owned or, should I say, ever owned us. When we rescued her from our local shelter she was shy and scared of her own shadow. I cringe to think what made a six month old puppy so frightened of everything. We worked with her tirelessly and it took a couple of weeks, but we gradually won her over and she was soon acting like she owned the place. Roxanne’s specialty was chewing; before we knew it, she had chewed the accent lighting off our deck in the back garden and disabled our air-conditioning by chewing the wiring in two. As if this wasn’t enough to make us want to kill her; she also took great pleasure in sliming our young daughter’s head and making her cry by either pushing her down or scratching her with one of her enormous paws. I hate to admit it but getting away from Roxanne definitely factored into our decision to move to the UK. We were sad yet greatly relieved when we dropped Roxanne off at her new home in the country with the sweet old lady who, no doubt soon after we left, was walking around her home in the hot Texas sun wondering why her air-conditioning had stopped working. Sorry, I've gotten ahead of myself so let me back up a bit. When my husband and I got married, my dowry was a beat up Datsun 200sx and a beautiful blonde cocker spaniel named Kara. Kara was a well bred, gentle creature that never thought to growl or snap at anyone or anything. Never ones to leave well enough alone, we soon bought a black and white cocker spaniel to keep her company. Louie, as we named him, was a crazy little monster from the start. He loved knocking the trash bin over and making a huge mess while digging through it. He once ate a metre long piece of cling film out of the trash and had to have it extracted through his business end. He was an escape artist as well. He once made his way to freedom through a hole in the fence wearing one of my new bras that became looped around his neck while rummaging through our dirty clothes basket. Thank goodness that one of our more friendly neighbors brought him to our door before he got too far. Our relationship with him ended abruptly when he bit our baby. Even that adorable black and white spotted face couldn't save him from that one. Kara on the other hand was with us until she quietly slipped away from us from natural causes at a ripe old age. We still miss her. We had a blissful five year gap between family pets during the time we lived in the UK. Upon our return back to the US, we could no longer put our children off with vague promises and adopted the critter that we still have to this day from our local human society. The day we adopted him, we were escorted into a small room packed with dogs of all sizes. The barking was deafening. Off in the corner, on the bottom row of crates that were stacked three high was this little white head peeking through not making a sound. I instantly fell in love with this silent little guy (check out his photo on my January 31, 2009 post titled, Weighing In). We took him home and named him Scruffy. We have lived happily together ever since. Oh sure, he has his faults but they don’t seem so bad next to a biter and a chewer. If you ask me, he’s right up there with Kara, a world class dog and to top it all off, he has only barked once or twice since we have adopted him. Good boy! All of these dogs, as different as they may seem, all have one thing in common. They have all been an integral part of the canine tasting and clean up crew in my kitchen. Since there is always a lot of cooking going on, there is also a lot of food dropping goin on. Oh sure, some have been easier to please than others. Louie loved anything from chicken bones to cling film. One of his favorites was the occasional ice cube that would dislodge itself from our aging in-the-door ice dispenser and crash to the floor in a spectacular burst of ice shards. He would run over like a streak, greedily gobbling up every bit as if was raining beef fillets. With Louie around, there was no such thing as the five second rule, nothing lasted on our floor that long. Scruffy on the other hand is a bit more picky, he would never eat an ice cube, he detests eggs of any kind and prefers only red gummi bears. From one extreme to another. The first recipe I have chosen to share here is a tribute to a great dog. It is just as simple as it is delicious; it is for my crisp and buttery croutons. Kara just lived for the day I dropped one of these on the floor. Since there are usually so many of these crowded on the sheet pan and they have to be stirred, chances are pretty good that a handful of them will land up spilling off the side of the pan. These are best when gently tossed with only the very best salad dressing. Coincidentally enough, the recipe for my extraordinary (if I do say so myself) Caesar salad follows. I am really doing my best to reinstate Caesar’s good name here. In years passed, Caesar dressing has gotten a bad name because so many restaurants passed off so many poor versions that no one really knows what good Caesar dressing is supposed to taste like anymore. As a college student, I tossed up hundreds of Caesar salads for members of Houston society to rave reviews which I feel makes me somewhat of an expert. Served with either a grilled steak in the summer or a comforting bowl of soup in the winter, this is a dish for all seasons. I know that this sounds like a lot of butter but they are just perfect when they are buttery and crispy. I usually double this recipe because in addition to being great as a salad topping, they are an awesome snack. This is a great way to breathe fresh life into any type of lightweight bread stuff that is about to go off. You’ll never buy store made croutons again. Preheat oven to 300F, 150C, Gas Mark 2. In a small saucepan, over medium low heat, melt the butter with the garlic and onion powder. Set aside. Place the bread on a cutting board. With a serrated knife, remove the crusts if desired and then cut into 9 cubes of equal size. 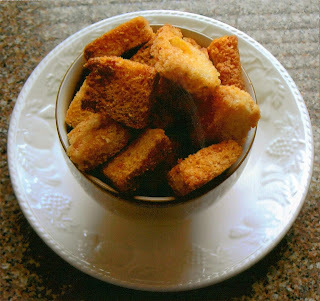 Place bread cubes in a large bowl; drizzle 1/2 of the butter mixture and cheese over the top of the bread cubes. Toss bread to coat. Pour the remaining butter and cheese on top and toss until the bread cubes are covered. Transfer bread to a large shallow baking pan or cookie sheet; spread out in a single layer. Place in the preheated oven and bake for approximately 30 minutes, stirring every 10 minutes or so until the croutons turn a golden brown and are crispy all the way through. Remove from the oven and cool completely. Place any uneaten croutons in an airtight container. This recipe makes enough for a couple of Caesar salads or one salad and a midnight snack. For something different, feel free to add small amounts of herbs such as thyme, dill or sage to the butter. Although its exact origin is unclear, one thing that is clear is that it has been a well loved salad recipe since the mid 1920s. For me, it had its origin in a little Italian restaurant in the Montrose area of Houston in the late 1980s where I learn to make it and it has since become one of my signature dishes. I love changing it up by adding chilled (never hot) chicken, shrimp or salmon or vegetables like avocado, asparagus, tomatoes or cannellini beans. Pour the salt in the bottom of a large salad bowl. Take two forks, stab garlic clove toward one end with one of the forks. Holding the clove down with the fork, shave the garlic with the edge of the other fork until it is completely crushed. Add the spring onion and grind between the bowl and the fork. Repeat the same procedure as the garlic with the anchovy. If you don’t have any anchovies or don’t care for then like me, don’t worry, you’ll still have great results without them. Add the mustard and stir the contents of the bowl together. Add the egg yolk and stir well. Stirring quickly with the two forks or a small whisk, drizzle the olive oil slowly into the egg mixture. Stir until the yolk and oil emulsify and form a thick and creamy mixture which is the consistency of mayonnaise. Stir in the vinegar, lemon juice, a generous grinding of black pepper and ½ of the Parmesan cheese. Sprinkle the lettuce leaves and croutons on top of the dressing in the bowl. At this point you can either cover and refrigerate and wait until later to toss and serve, or gently toss. Sprinkle the top with the remaining Parmesan cheese. Serve immediately. Love to hear about your dogs. Can't wait to try the croutons with the caesers salad. I really enjoyed your blog post! We have a canine friend of our own and can totally relate to your experiences. I really enjoy a good caesar salad with fresh croutons too. Dogs are always a good company. Love croutons and salad together. I'm sorry its been so long since I've paid you a visit so I thought I'd pour a cup of tea a have a laugh with you. Great writing. I always enjoy your stories. I love a good Caesar with fresh croutons. This looks delish.